Examining questions about American women as candidates, officeholders and voters. There are 312 statewide elected executive offices nationwide. Not all of these offices are up for election in 2016. This post reviews women’s presence among the candidates competing for the positions being contested this year. Seventy (40D, 27R, 3NP) women filed to for statewide elected executive offices in 18 states in 2016. This includes 6 (3D, 3R) women who filed to run for governor in 5 states and 16 (10D, 6R) women who filed to run for lieutenant governor in 9 states. The remaining 48 (27D, 18R, 3NP) women filed for 11 different statewide elected executive offices in 16 states (attorney general, comptroller, corporation commissioner, insurance commissioner, labor commissioner, public lands commissioner, public service commissioner, secretary of state, state auditor, state treasurer, superintendent of public instruction). There are only 12 states with gubernatorial elections this year, making it making it impossible to achieve any new records at this level. The record number of women filing for governor is 34, set in 1994 (18D, 15R, 1ACP). 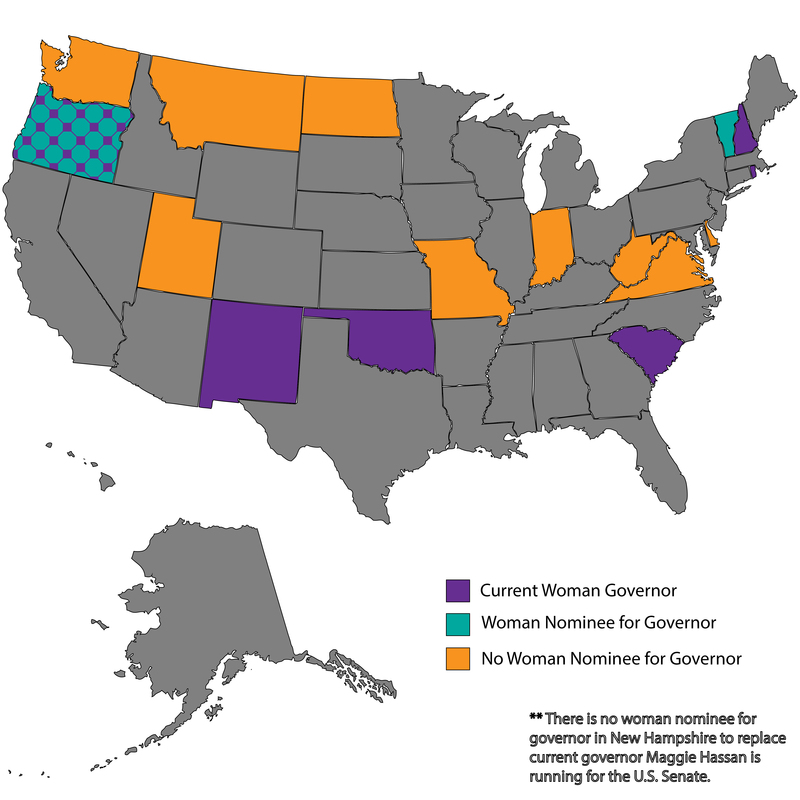 No women filed in half of the states holding gubernatorial elections this year. Among those who did, women candidates earned party nominations for governor in only 2 states: incumbent Democratic Governor Kate Brown in Oregon and Democrat Sue Minter in Vermont. The record for women gubernatorial nominees is 10, set in 1994 (6D, 3R, 1ACP) and reached again in 1998 (6D, 4R), 2002 (9D, 1R), 2006 (5D, 5R) and 2010 (5D, 5R). Just 6 (4D, 2R) women are nominees for lieutenant governor this year, far below the record number of 29 female nominees for lieutenant governor in 1994, a year when 36 states held gubernatorial elections. In 2016, 3 (2D, 1R) women candidates are challengers and 3 (2D, 1R) are running for open seats. Among this year’s lieutenant governor candidates are two women of color, both challengers: Christina Hale (D-IN), who is Latina, and Linda Coleman (D-NC), who is Black. Thirty-four (19D, 14R, 1NP) women are nominees in 14 states for the remaining statewide elected executive offices. Fifteen (7D, 8R) are incumbents, 5 (3D, 2R) are challengers, and 14 (9D, 4R, 1NP) women are running for open seats. Women of color are one-fifth (5D, 1R, 1NP) of these nominees, including 3 (2D, 1NP) Black women, 2 (2D) Native American women, and 2 (1D, 1R) Latinas. Women currently hold 75 (32D, 42R, 1NP), or 24%, of the 312 statewide elected executive offices nationwide, including 6 (3D, 3R) women governors. One incumbent woman governor, Maggie Hassan (D-NH), is running for the U.S. Senate this year. In order to maintain women’s current level of representation in gubernatorial offices, both female nominees will have to win their races this year. According to the Cook Political Report, Governor Kate Brown (D-OR) is likely to keep her seat. Sue Minter’s (D) contest in Vermont is rated as a “toss-up” in the final days before the election. It is certain that we will not see a record number of women governors in 2017. The record number of women serving as governor simultaneously is nine, achieved in 2004 and 2007. Twelve (4D, 8R) women currently serve as lieutenant governors. None are up for re-election this year. There will be a gain of at least one female lieutenant governor in 2017 because two women are competing against each other in Indiana. Democrat Bethany Hall-Long is also favored to win her bid for lieutenant governor of Delaware this year, as Democrats have held this seat since 1993. Thirty-eight (13D, 25R) of the remaining 57 women currently serving in statewide elected executive office are not up for election in 2016, retaining their posts through 2017. At least one of those women may leave her post, however. California Attorney General Kamala Harris (D) is currently favored to win the U.S. Senate race in her state. Indiana: Democrat Christina Hale, if elected, will be the first Latina elected to statewide elected executive office in that Indiana. She is running against another woman, Republican Suzanne Crouch. ​Missouri: Democrat Robin Smith, if elected, will be the first woman of color elected to statewide elected executive office in Missouri. Democrat Teresa Hensley, if elected, will be the first woman Attorney General of Missouri. North Carolina: Democrat Linda Coleman, if elected, will be the first woman of color elected to statewide elected executive office in North Carolina. North Dakota: Democrats Ruth Buffalo and Marlo Hunte-Beaubrun are two of three Native American nominees for statewide office in North Dakota this year. If elected, they will be the first women of color elected to statewide elected office in North Dakota. They would also be just the second Native American woman ever elected to statewide executive office nationwide; Denise Juneau (D-MT) was the first Native American woman elected to statewide elected executive office in 2009. Vermont: Republican Deborah Bucknam, if elected, will be the first woman attorney general of Vermont. Washington: Democrat Erin Jones, if elected, will be the first woman of color elected to statewide elected executive office in Washington. Democrat Pat McCarthy, if elected, will be the first woman state auditor of Washington. West Virginia: Democrat Mary Ann Claytor, if elected, will be the first woman of color elected to statewide elected executive office in West Virginia. For the latest numbers and information about women running for office in 2016, visit CAWP’s Election Watch 2016. Election results will be posted as they are reported on CAWP’s website and social media.